I am, in this edition, taking another break from the established convention for the blog: to write about something brand new, on its release date no less. Once again that is a movie, and I am doing so having had the privilege of attending one of The Visit‘s (2015) many preview screenings and Q&A sessions with its writer-director, M. Night Shyamalan—this one last week in London at the lovely, characterful Picturehouse Central courtesy of Den of Geek. Given it is a brand new release I should preface this piece with a word or two of caution that, due to the nature of the topics I consider, this post contains some MAJOR SPOILERS about the content of the film. So please only read on if you have already seen the movie, or if you have no objection to learning some key points about its plot. M. Night Shyamalan is to be commended as a film-maker who takes risks and who seeks to make original films of artistic merit. Indeed, my appreciation of his canon has only been amplified by author John Kenneth Muir‘s typically detailed and thoughtful recent series of posts exploring Shyamalan’s work. But my concern here on the blog remains as follows: are the film’s representations of mental illness appropriate and accurate, and what do they convey in the context of the film when taken as a whole? 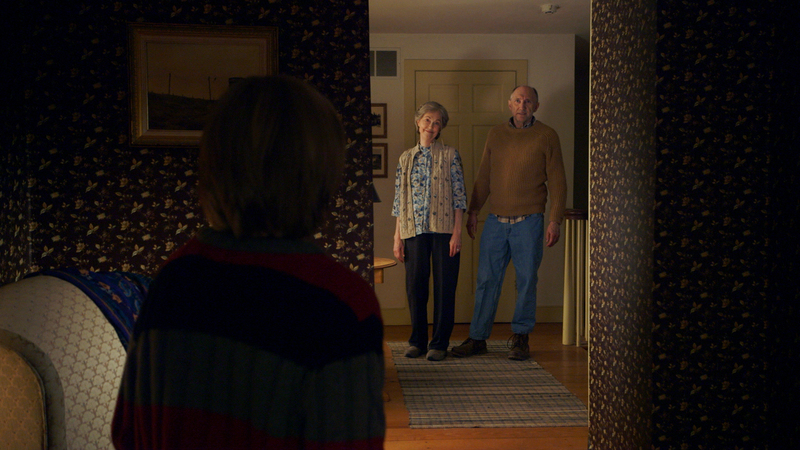 The Visit tells the tale of two children, teenager Becca (Olivia DeJonge) and her younger brother Tyler (Ed Oxenbould), who are sent by their single mother (Kathryn Hahn) to stay with her parents for a week whilst she goes on a vacation of her own with her new boyfriend. Becca and Tyler have never met their grandparents, as they have been estranged from their daughter for fifteen years following a falling-out. Across the course of their stay, the behaviour of Nana (Deanna Dunagan) and Pop Pop (Peter McRobbie) becomes more and more bizarre. They lay down a strict rule that the children should not come out of their rooms after nine-thirty at night, explaining that they are old and need peace and quiet from this time. But Becca and Tyler hear strange sounds during their curfew, and, their interest piqued, sneak a look only to find Nana embarking on strange behaviour after dark: vomiting openly as she walks the hallways, clawing at walls whilst naked, and the like. Meanwhile, after becoming suspicious of Pop Pop’s secretive behaviour in the toolshed they learn of his incontinence and that he hides his diapers there before burning them. Events take an even more sinister turn as Becca—a would-be documentary filmmaker whose camerawork makes for the audience’s point of view for much of the film—and Tyler seek to delve deeper into these strange goings-on. Nana and Pop Pop’s behaviour becomes yet more unsettling and, ultimately, monstrous as the film builds the tension towards a disturbing climax. 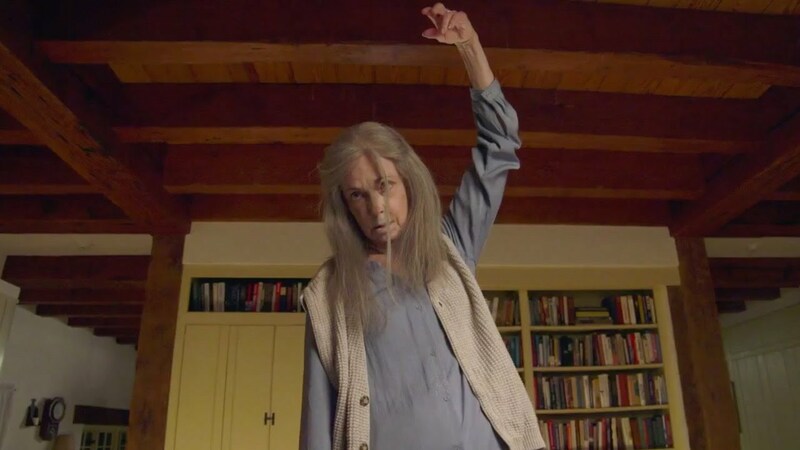 One of The Visit‘s earlier titles was Sundowning, and the implication during at least part of the film is that this is the root cause for Nana’s bizarre behaviour. Sundowning is a known and defined phenomenon wherein some dementia sufferers suffer increased levels of confusion and agitation after dark. Its symptoms do not, however, suggest the increasingly murderous and often calculated intent that Nana exhibits towards Becca and Tyler. The Visit‘s big reveal (did I mentioned SPOILERS?) is that this elderly couple aren’t Becca and Tyler’s grandparents after all, but rather escaped psychiatric patients who have murdered their real Nana and Pop Pop and taken their place. Our mental illness focus thus shifts from dementia to, it is intimated, schizophrenia. And I’m afraid my heart sank at this plot development. The audience is to believe that an elderly couple suffering a condition characterised by psychosis and paranoia have concocted an elaborate scheme to play-act the role of being grandparents to these children in order to wreak a week-long campaign of terror and then, ultimately, to murder them. It is, quite frankly, ludicrous—a contrivance as out-dated as it is improbable. Towards the end of the Q&A that followed the screening I attended, there was an uncomfortable question posed of Shyamalan from someone who had just lost a grandparent to dementia, asking whether or not he was concerned that The Visit acted to demean or demonise sufferers. The writer-director’s response was, I felt, somewhat dismissive, stating that this was not his intent and that he hoped it would not be interpreted in this way, as his intent was merely to “have a bit of fun” with the set-up. For me, though, the question was a reasonable challenge, and, if anything, the response only amplified the concern. Is it churlish, then, to judge these aspects of The Visit on terms which it in no way seeks to represent itself? (And especially so having been invited to a free preview screening intended to prompt word-of-mouth momentum for the release?) From my perspective I’m afraid I don’t see it that way, and here is another reason why. During the Q&A after the screening I attended, Night spoke several times about the “human drama” at the heart of his approach to filmmaking. In fact, he went so far as to his state that his “secret formula” is to “make dramas and pretend they’re genre movies”. I don’t doubt this, and, indeed, it is as true of The Visit as it is of his other films. He spoke of how the movie is very clearly to him about the need for forgiveness and letting go of anger—from the children’s mother towards her own parents having left it too late to reconcile with them, and also in her pleas to the children over their own estranged father. Night went on to tell of how that theme was inspired by circumstances in his extended family, and how this is tied to the culture of pride above all else in many Indian families. Yet, if anything, this mix of human drama, comedy and horror that combine in The Visit to produce such a unique tone only makes his representation of the elderly couple all the more jarring and discomfiting. If this were an out-and-out horror movie with no subtext then I could perhaps shrug it off, but the fact that it seeks to be underpinned by a human element eviscerates any “fun” quotient for me, and undermines that dramatic core. I am aware, too, that the representation of the “grandparents” can be taken to be non-literal: that the “real” Nana and Pop Pop have been wrongly demonised in their own way by their daughter until the truth about them is revealed, and that the sustained lack of contact between family members has led directly to the tragedy that befalls them. Even so, for me, the representation of either condition put before the audience—dementia or schizophrenia—is deeply problematic, and could have been handled in a more sensitive way whilst still delivering the dramatic message at its twisted heart. There were elements of The Visit that I appreciated. Night said how he always tries to cast theatrically-trained actors as he does long takes. This was particularly important to him in the case of Dunagan and McRobbie as he was seeking “delicate actors” to ground their performances in a “value system”. Both actors therefore had an internal logic for even the more bizarre behaviours they were called upon to enact as opposed to just trying to scare the audience, which therefore translates to a much more unsettling and confounding viewing experience as a result. This interests me as it was particularly effective in that intent and speaks to the artistry of both director and actors, but I’m afraid my deep-seated reservations really tarnished the whole experience for me. Clearly, M. Night Shyalaman never set out to make a movie that was in any way representative of either dementia or schizophrenia, and perhaps audience members less encumbered by my concerns on the topic of how mental illness is represented will enjoy the film on its own terms. Night spoke, too, about how a movie is for him like a “date with the audience” and how he needs to to meet them in the middle ground of their expectations in order to deliver a satisfying experience whilst he sneaks in his true message. Perhaps that explains some of the creative choices he made in The Visit, and perhaps it will deliver a very successful movie in many respects as a result. I only wish it could have done so whilst also serving to educate and redefine the common understanding of two such debilitating conditions, as opposed to reinforcing out-dated and self-defeating stereotypes. Nicely put. I came here because I was frankly shocked by the outdated and crude depiction of mental illness in this film. Thanks, Toby—I’m completely with you. I recently completed an excellent course at my local cinema on cinematic representations of mental illness (see my most recent and forthcoming posts for more on this) and, amongst other things, that has been useful to put some older films into context with the times in which they were made. As for “The Visit”, though, released just three years ago… there really is no excuse.